When I first sat down to write a blog for the exhibition Patrick Scott: Image Space Light, I had a different plan in mind. 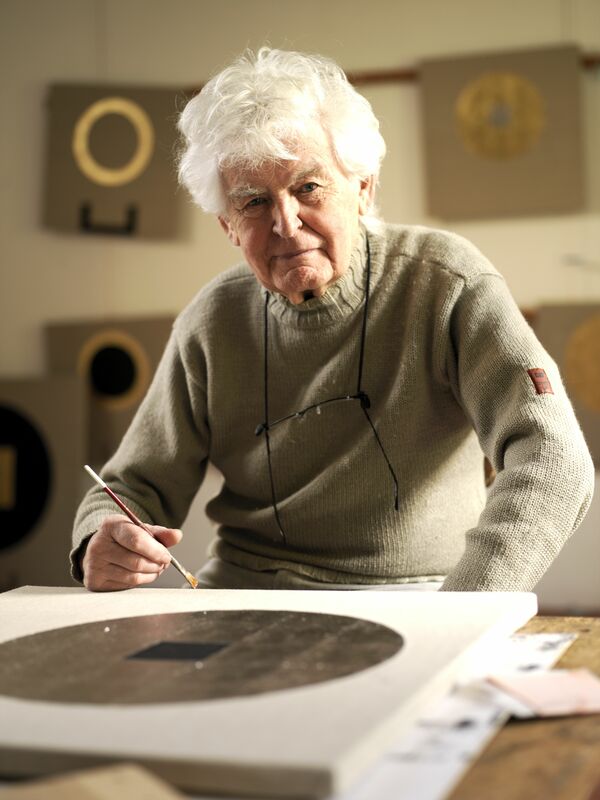 Then sadly Patrick passed away on Friday the 14th February, the day before the opening of his exhibition at IMMA. 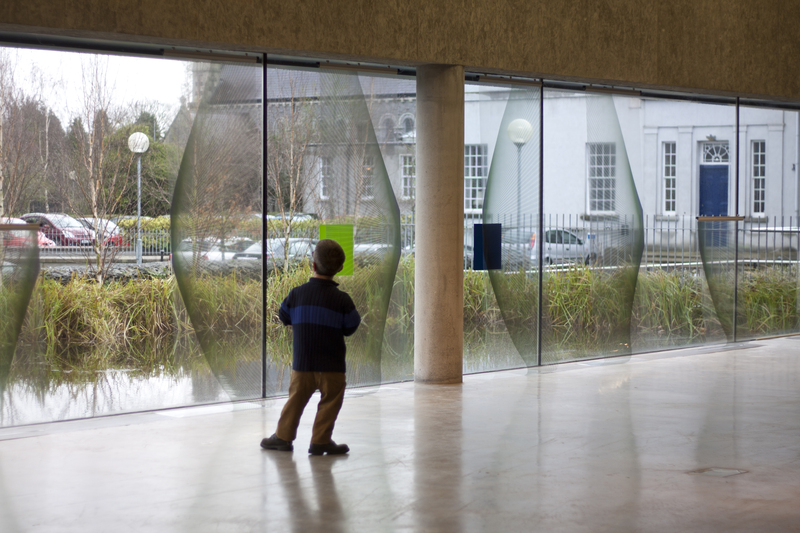 It has been a privilege to curate the exhibition Patrick Scott: Image Space Light, which is currently running at IMMA and VISUAL Centre for Contemporary Art Carlow. The exhibition now performs the double role of being a major tribute to the extent and calibre of Scott’s work as an artist, designer and architect and the esteem in which he is held. By engaging with his work, there is an immediate and poignant connection with the talent and life of a wonderful individual. One of the defining aspects of working on this exhibition was the need to curate it across two venues and as a single exhibition. As well as enabling a much larger exhibition, the dual aspect provided unique and exciting challenges as the two venues could not be more different. 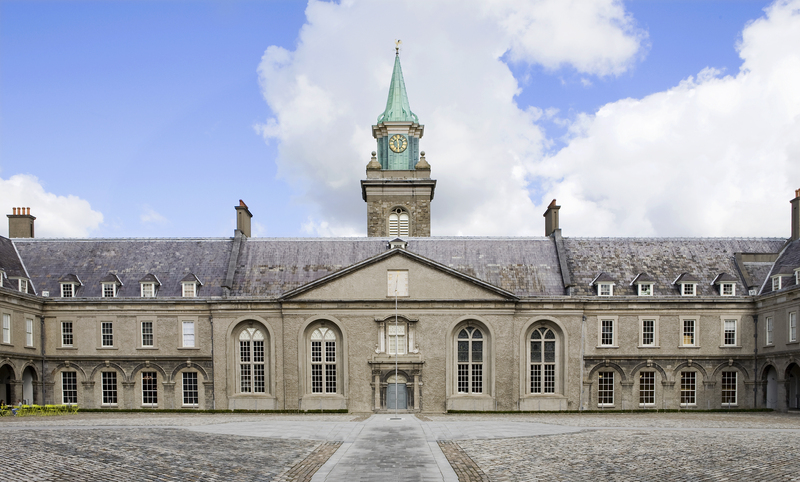 At IMMA the Garden Galleries consist of the intimately scaled 18th century rooms of the former Deputy Master’s House of the Royal Hospital Kilmainham. Diametrically different, VISUAL is a purpose-built multi-disciplinary art space whose exhibition galleries comprise a monumental main space whose floor plan is 29 x 16m with a ceiling height of 11m as well as three other expansive spaces. 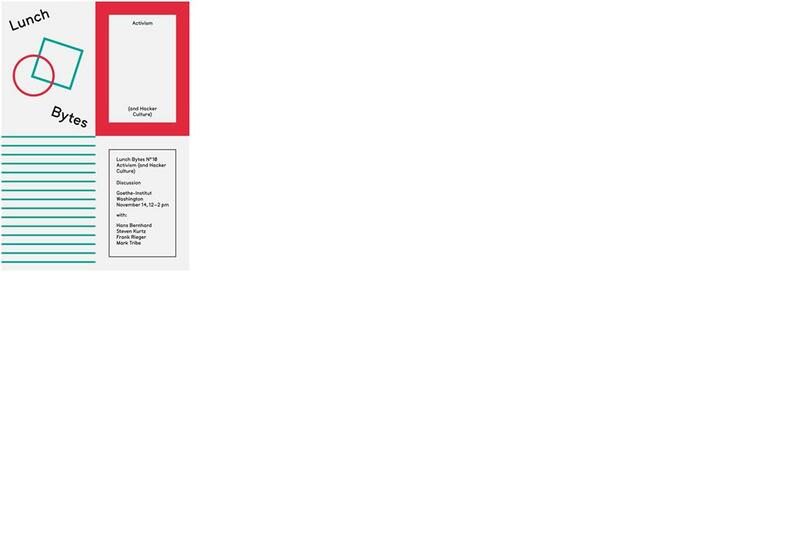 The characteristics of each gave rise to distinct curatorial decisions. From the start it was clear that the first half or Part I of the artist’s career would best be appreciated in the intimate spaces of the Garden Galleries at IMMA. Its first floor rooms are ideal for experiencing the smaller scaled ‘White Stag’ related paintings of stylized birds and fish in schematic landscapes and the still-lifes, wire and scaffolding motifs that Scott abstracted from everyday life during the 1950s. These rooms also provide a focused setting for the reiteration of part of Scott’s representation of Ireland at the Venice Biennale in 1960 (IMAGE) twigs and books. Key early Gold Paintings and the unique Rosc related works provide contemplation and drama in equal measure in the naturally lit, ground floor rooms. 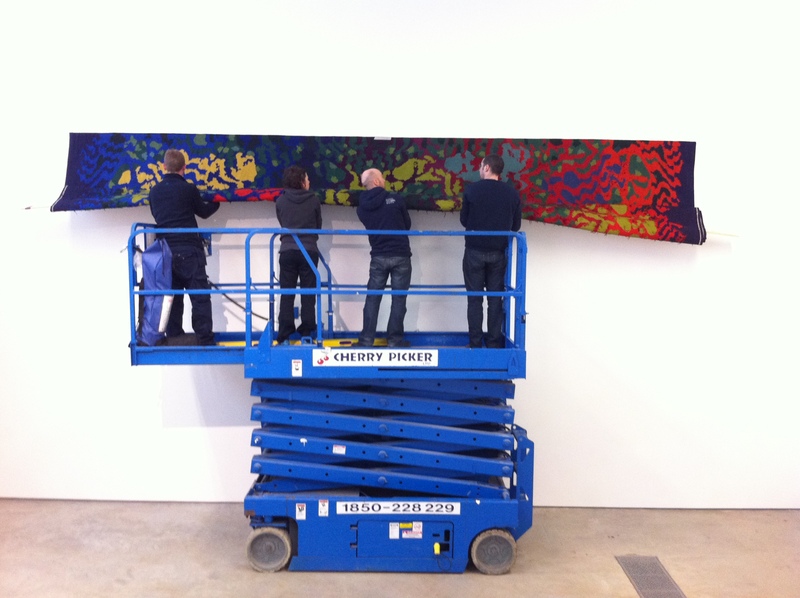 VISUAL on the other hand facilitates Scott’s larger scale works, many of which were produced in the latter half of his career such as the tapestries. Installed in the studio gallery, they are richly coloured abstract designs derived from the artist’s thumbprint and were mainly woven at Aubusson (France) and with V’Soske Joyce (Galway). The largest were created for the minimalist interiors of corporate modernist buildings from the 1960s onwards. In the main space is the 20ft canvas Kite! accompanied by a signature representation of Gold Paintings from the late 1960s to 2007 as well as examples of Scott’s furniture including folding screens and Tables for Meditation. When doing research for the show last year, I had numerous brief meetings with Pat, as much as he could manage. We talked about aspects of his practice, in so far as Pat would ever give much away about his work. “He doesn’t exactly sell himself,” was how his good friend and critic the late Dorothy Walker once put it. We discussed in whose collections certain works were located, ideas for the installation and what works might be located at IMMA and those for VISUAL. 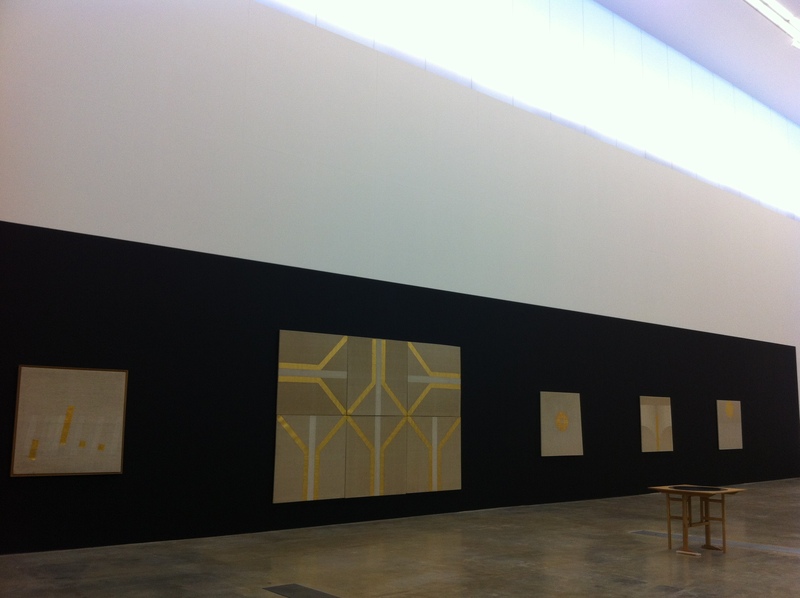 Pat knew the IMMA spaces well and had visited VISUAL on the occasion of Michael Warren’s exhibition there in 2010. As curator, an aspect I wished to bring to this latest consideration of Scott’s work was to include a direct response by a younger generation artist with an empathy towards Scott’s work and also towards architecture. I invited Corban Walker to guest curate a selection of works by Scott for the Link Gallery, to write a text for the catalogue and to make a work in response for the window area of the Link Gallery. Corban grew up among Pat Scott works which hung in the home of his parents, Dorothy and Robin Walker and his friendship with Scott contributed to his own artistic direction. I had previously worked with Pat on his retrospective exhibition, curated by Yvonne Scott, at the Hugh Lane in 2002 (when he was a young 81). My abiding memory is of his central presence in all decisions to do with the installation, conveyed in his economical, good humoured, no fuss manner. I felt a particular obligation to convey as closely as possible to him how this exhibition was evolving. I was thrilled along the way when Pat offered me the chance to go through his papers, assisted and mediated by his partner Eric Pearce. This provided an archive of correspondence relating to Pat’s life: letters from friends, colleagues, relating to commissions, bills, good-luck telegrams when he opened the Venice Biennale for Ireland, press-cuttings etc and fascinating material and correspondence relating to his work as a designer, which the exhibition now draws attention to. The decision to install Kite! in the main exhibition space at VISUAL influenced all others decisions for that space. It was always my intention to situate the Gold Paintings there and the challenge was to find some way of marshalling the vast gallery space. The reason to paint was twofold: to provide a strong background for the Gold Paintings as well as to create a sort of architectural intervention. A frieze of translucent white glass nearly 4m deep comprises the top ‘one third’ of the main space and admits a quality of filtered daylight that immerses everything and causes objects to seem to emit light. I decided to paint running sections of the walls a chalky dense black, to a height of 380cm but not all the way to the corners so that the space might retain a fluid, open feeling. In effect it divided the wall into three horizontal zones: daylight, white and black. Twelve years earlier for his retrospective, Pat had had certain rooms of the Hugh Lane Gallery painted cobalt blue, a deep ‘studio’ green and what he called ‘bull’s blood’ red as the settings for the Gold Paintings. The effect was extraordinary. A few months ago, when I visited the Tate’s Paul Klee exhibition I was struck by the effect on the works of the incidental black walls that punctuated the exhibition. Influential too was a passage from Mel Gooding’s essay about Scott’s work which begins by referencing Junichiro Tanizaki’s In Praise of Shadows, which marvels at the wonderful ability of gold to capture a mere glimmer of light “then suddenly send forth an ethereal glow, a faint golden light cast into the enveloping darkness, like a glow upon the horizon at sunset…gold retains its brilliance indefinitely to light the darkness of a room”. In my mind, the black wall functions variously as a sort of shadow space, a dark cloister, a cinematic zone, a metaphysical place from which the Gold Paintings emerge, with sculptural effect, while the orange and black painted drawing that is Kite! magnetizes the floor space. “Brave,” Eric Pearce described it! Christina Kennedy will be giving a Lunchtime Gallery Talk Friday 14 March 2014. Book here.